Ten years ago I was introduced to Terry and wife Sue by Trevor Pearce, they had been life long friends. Together, a group of us founded the Great Wyrley History Society, after seeing the growth of the Cheslyn Hay History Society. 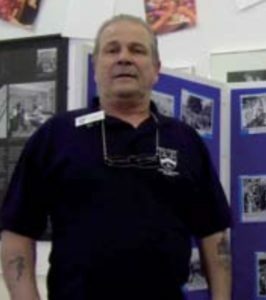 Terry played an important roll, he was our first Secretary and formed part of our committee. We started doing small exhibitions and stalls at the local carnival, where Terry was always on hand to help, whatever the task. We never always saw eye to eye, as he was ‘gold and black’ and myself ‘blue and white stripes’ but we worked well together. Due to Terry’s breathing problems, he left the society, as it became to much for him. He took up a new hobby playing computer games, when his son Chris introduced him to Runescape and the World of Warcraft. We still had contact, but noticed that his breathing was getting worse. He would use a scooter to get around and would carry an oxygen tank, which he became reliant on. The following is a letter received from Jenni, granddaughter of Thomas and Nellie Garratt. Whilst visiting from my home in Australia, I came to see the bench in memory of my grandparents Thomas and Nellie Garratt. 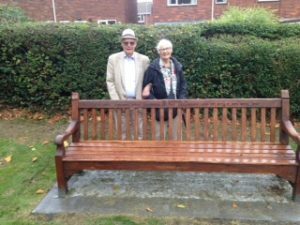 The bench has been restored after damage and placed in the Great Wyrley Memorial Garden. My grandfather is part of the Garratt family who have been in Great Wyrley as miners since 1830, my grandmother Nellie Hemmingsley is from a similar Cheslyn Hay family. I lived in Great Wyrley since early childhood until leaving to go to University. Ours has been a family deeply involved in the life of the village, both my parents, Jim and Marion Homeshaw being Parish and Rural District Councillors. Thomas was one of those responsible for the building of the ‘Institute’ and establishment of a library for the use of working men. Nellie formed the Cooperative Women’s Guild which provided social and practical help for local women, many of them miners wives who lived very hard lives. Living in Great Wyrley during World War 2 and after, I was very aware of the importance of the Memorial Gates, especially during the Remembrance Service each year. services. We must not forget those who kept us alive working in agriculture and factories. Friends of Great Wyrley Memorial Garden (FROGS) have recently done a huge Amount of work so that it is now a place of peace, tranquillity and beauty. Many thanks are due to them and the Great Wyrley Parish Council for creating this asset in the centre of Great Wyrley. This is only the start: updating of information and repair is necessary for the gates and the group wish to add to the site to improve information for the community and to make more widely available e.g. through the library and schools, knowledge of the history and meaning of our village and those who lived here. I heartily support their efforts and hope funding will be made available to them.